Edith Ritchie passed away at the care home in Ellon where she lived with her sister. 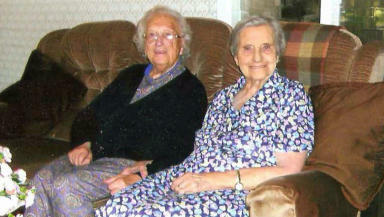 One of the world's oldest twins has died in Aberdeenshire aged 104. Edith Ritchie passed away at the care home in Ellon where she lived with her sister Evelyn Middleton on Saturday. The pair, who were born in 1909, were named the world's oldest twins in the 2012 Guinness Book of Records. The sisters were born on November 15, 1909, when King Edward VII was on the throne. The twins were born in Foveran to a farm worker father and celebrated their 104th birthdays last year. Ms Ritchie was described as a "cherished sister” by Laura Winton, an administrator at the Bonnyton House care home, where Evelyn still lives. She said: "We were sorry about Edith's passing. Both she ad her sister had stayed with us for the past few years and she was just lovely. “Their bedrooms were next to each other they sat together everyday and they had meals together too. She was a just a really nice woman." The non-identical twin sisters were schooled at Barthol Chapel and Udny Green before working on farms from the age of 13 until they married. Mrs Ritchie married her late husband Nathaniel, who died in 1987, in 1929 and raised four children together. They had nine grandchildren, 21 great-grandchildren and three great-great-grandchildren. Mrs Ritchie's funeral service will be held at St Mary on the Rock, in Ellon, this Friday at 11am.